Originally named ‘Hit and Run’ when it was founded in 1998 by Fraser Cooke and Michael Koppelman , The Hideout store grew out of a need for a specialist boutique dedicated to bringing Japanese and American streetwear to London. Koppelman had witnessed the growth of streetwear in the US with the likes of Stussy and the speed at which it had gained popularity in Tokyo inspired him to bring the style to the UK. Many consider The Hideout the first mutli-brand, streetwear store outside of Japan and its success led to the opening of Foot Patrol by the two just four years later. Japanese streetwear labels that are now considered veterans in the game were first introduced to the UK by The Hideout and brands such as Visvim, Neighborhood and W-Taps all cemented their status in London through this avenue. The Hideout have also been more than influential in the development of retailer collaborations and Special Make-Up footwear and their 2006 Nike Woven Footscape collab remains one of the most sought after shoes by sneaker purists and hypebeasts alike. 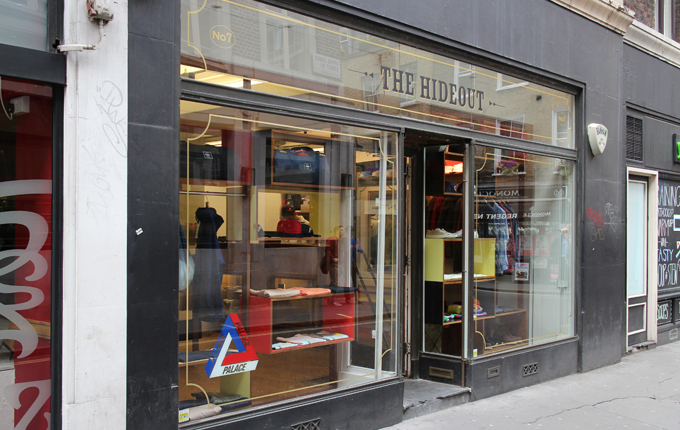 Still a staple in the London scene, The Hideout continues to stock the very best the international streetwear industry has to offer and have quite rightly earned their legendary status within the culture.